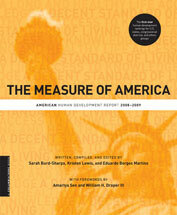 The Measure of America is the first-ever human development report for a wealthy, developed nation. It introduces the American Human Development Index, which provides a single measure of well-being for all Americans, disaggregated by state and congressional district, as well as by gender, race, and ethnicity. The Index rankings of the 50 states and 436 congressional districts reveal huge disparities in the health, education, and living standards of different groups. Clear, precise, objective, and authoritative, this report will become the basis for all serious discussions concerning the realization of a fair, just, and globally competitive American society.